Ouside my window at the Koryo Hotel was an almost-symmetrical stand of buildings, connected by a common plaza. The neon signs on the outside of the low buildings are for restaurants - however during my entire stay there, I never saw any of these shops open, nor anybody go in or out. The windows were all darkly tinted, and I actually saw basically no signs of life from these buildings. At night, a few of the lights in the apartments would go on, but only one light per window. The neon signs would turn on around sunset, but turn off around 10pm every night - still with no activity at all. It very very much felt like this entire group of buildings was setup purely for show, with no real activity happening here at all. There were items on the balconies, but it was either a pot of fake flowers, or a solar panel. The entire vibe of the street outside, despite being in the middle of Pyongyang, was silent and empty feeling. Ouside my window at the Koryo Hotel was an almost-symmetrical stand of buildings, connected by a common plaza. The neon signs on the outside of the low buildings are for restaurants – however during my entire stay there, I never saw any of these shops open, nor anybody go in or out. The windows were all darkly tinted, and I actually saw basically no signs of life from these buildings. At night, a few of the lights in the apartments would go on, but only one light per window. The neon signs would turn on around sunset, but turn off around 10pm every night – still with no activity at all. It very very much felt like this entire group of buildings was setup purely for show, with no real activity happening here at all. There were items on the balconies, but it was either a pot of fake flowers, or a solar panel. 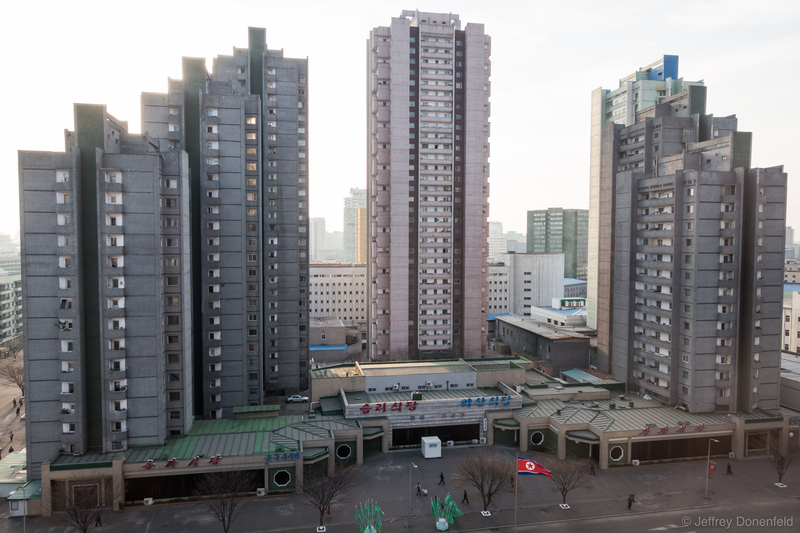 The entire vibe of the street outside, despite being in the middle of Pyongyang, was silent and empty feeling.